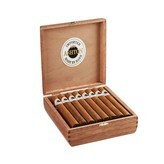 ‘Imported, Made By Hand’ declares the understated label of the Ashton Classic Corona cigar. These words, written in black on a white cigar band, are all that heralds a cigar that is both flavorful and smooth, and capable of producing a milky white smoke. The Ashton cigar line is manufactured by Arturo Fuente, one of the most iconic names in the cigar world. Although the patriarch of the Fuente family, the well-known and well-respected Carlos Fuente, Sr. has passed on, the company that his own father began is going strong and continuing to make fantastic cigars. Arturo Fuente, founder of the business that today crafts a wide variety of cigars for all tastes and price ranges, was a Cuban émigré to the United States after the Spanish-American War. The brand began in 1912, but Ashton was not the brainchild of the Fuente family alone, but rather of Robert Levin. Robert Levin came to Carlos Fuente, Sr., he had a dream. He wanted to meld his keen sense of what customers wanted, developed after years of running a smoke shop, with the expertise of the Fuente family. This combination led to the Ashton line we know today. The Ashton Classic Corona is part of the Ashton Classic line. It is a cigar that has between a medium and mellow body. A beautiful and handmade cigar, with tobacco from the rich soils of the Dominican Republic, lovingly wrapped in a Connecticut Shade wrapper, this blend is consistent in its flavor and quality. The flavor can best be described as rich, and the scent of the cigar is a toasty one, one of competing flavors of cashew and wood, along with a spicy aftertaste. A fantastic cigar for those looking for something on the lighter side, but still desiring some spice, or for anyone who likes to watch large plumes of smoke billow forth.